The length of a wedding gown depends on many factors. The time of day that the wedding takes place, the theme or style of the wedding, the bride’s personality and preference, and in some cases, whether this is a first wedding or subsequent wedding. There are some older brides who feel more comfortable having a second or subsequent wedding in a shorter dress. There are many lengths for a bride to choose from when it comes to choosing the right length for her gown. The above the knee length wedding gown has a hem that falls , you guessed it, above the knee. It makes a wonderful summer wedding dress, and is perfect for a destination wedding on the beach. Empire waist or form fitted works well in this length, but be careful with a fitted bodice and ballet or princess skirt, you may end up with it looking more like a tutu then a wedding dress. The knee length wedding gown has a hem that falls to the knee. This style length works well with an older bride who doesn’t want to wear a full length gown, and looks great for more casual weddings as well. A knee length hem works well with a dress that is more fitted in the bodice and waist area due to the shorter length. A dress that is more flowing or an empire waist dress could end up looking more like a maternity dress due to the shorter length, if the bride is not super thin. A street length dress isn’t much different than a knee length dress, although the length is a bit longer. Street length hems fall just below the knee and works well for a bride who may not be happy with her legs, as this style falls at a very flattering length. It also works well for casual weddings, outdoor wedding and weddings for older brides who don’t feel comfortable in a full length gown. A street length gown works well with many styles of silhouettes, including a fitted bodice, a halter style gown, or a tank style top. Best known as tea length, the intermission length gown, falls anywhere between the knee and the ankle. This is a great length for an outdoor wedding, a daytime wedding, and can be adapted for a casual wedding as well by having a looser, sheath style gown with an empire waist, which will give it somewhat of a Grecian look. This length works well with any body type and any age as well. Even for the older bride, it gives the elegance of a wedding gown without the full length. The ballet length hem falls just above the ankles just like a ballerina’s skirt. It is a very feminine look and is perfect for showing off a pair of beautiful wedding shoes while still having a formal length. A tulle or princess skirt at this length is flirty without being overstated. It works well with almost any type of gown, and can be used for both a daytime and evening weddings. Another good choice for outdoor and beach weddings, due to not having a hem or train that touches the ground. The ankle length hem hem falls just to the ankles, just slightly longer than ballet length. Many older, more mature brides that want a formal look choose this style, as it is very elegant without being overstated. It works well with any style of gown, and works well for daytime or evening weddings. It can also be a good choice for outdoor weddings, especially on the beach, due to not having a train that drags the ground. One of the most common lengths chosen is the floor length gown. This style works well for formal weddings, as it goes well with long trains and long veils as well. Whether the wedding is daytime or evening, the floor length gown gives an air of fantasy and works beautifully with ball gown styles. It’s a popular choice with most brides, and whether they choose a ball gown or a more fitted style, the floor length will compliment it well. There are many brides who love going for the more unusual styles of gowns for their weddings. The asymmetrical length gown works very well for this goal. The length of the dress is higher on one side than the other, giving the dress a unique and fun look. This length style works great for evening weddings, and weddings that have a more party atmosphere. Due to the unique length, the style silhouette that this length works with is a more fitted bodice and waist that skims the body more. For the outgoing bride, a mini skirt or thigh length dress can be a lot of fun and make a statement about her personality. 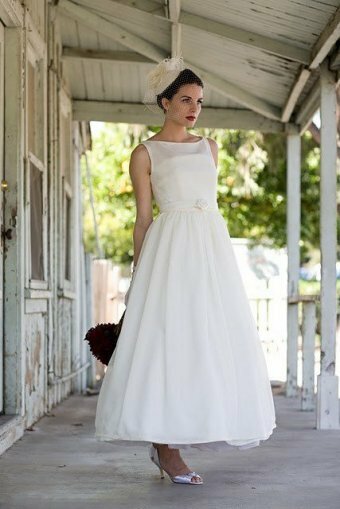 This is a great length for the younger bride, and works well with a halter style silhouette or a surplice style. This length is good for a casual evening wedding, a beach wedding or a daytime casual wedding.